Reverb technology is constantly evolving, but the vintage electro-mechanical studio plate remains a firm favourite with engineers and producers. Maybe its popularity is due in part to the fact that a plate doesn't suggest any specific type of acoustic environment — it just gets on with the job, fitting in with most musical genres. Its reverb is characterised by a rapid build-up in density, a lack of defined early reflections and just a hint of metallic overtones, all of which contribute to making it sit comfortably in a mix. 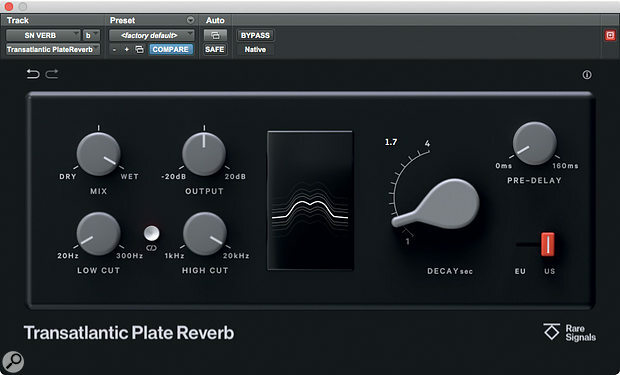 Rare Signals are new players in the plug-in market, and Transatlantic Plate Reverb is their first product. It was developed by recording impulse responses from two hand-picked and fine-tuned plate reverb units. One was custom-built in Nashville in the '70s, while the other is a classic German design — hence the Transatlantic name and the front-panel US/EU switch, which flips between the two plates. The control panel is clean and uncluttered, presenting just five knobs, a 12-step decay time rotary control and two switches. Each decay setting is derived from a separate impulse response recorded with the plate damped accordingly, so there's no time-stretching going on. The longest available decay time is around six seconds for the EU plate and four for its American counterpart. To the right of the panel is a pre-delay control, providing up to 160ms of delay, while wet/dry mix and output level controls are joined by filters that respectively cut the low frequencies in the input signal and the high frequencies in the output. A Link button allows both EQ controls to change together as mirror images of each other when you turn just one of the controls. An animated graphic reflecting aspects of the audio signal doesn't provide much useful information, but adds visual interest. 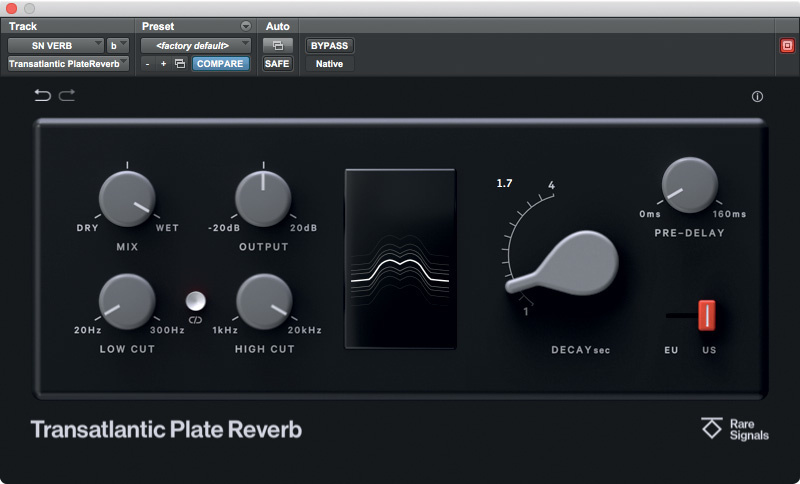 Some algorithmic plate reverb emulations can sound grainy when applied to percussive sounds, but as this one uses IRs taken from the real thing, it sounds appropriately clean and dense, capturing a very nuanced plate character. It works wonders on TR-808-style drum parts as well as vocals. In comparison with other high-end plate plug-ins from Waves and UA, the Transatlantic Plate offers a slightly different tonality, but I wouldn't say that any one sounds better than the other — it's more like the sort of difference you might hear between two real plates in different studios. CPU loading is fairly modest for an IR-based reverb, though I did find that large CPU spikes occurred if I tried to change the decay time with a track playing. This is quite understandable as switching decay times involves the plug-in loading a new IR. Tonally, the US and EU flavours are noticeably different. The US model is unusually bright and airy for a plate, while the EU plate produces a thicker sound with more mid-range aggression. Both sound very authentic and it is good to have a choice. Don't be put off by the modest control set and streamlined interface: this is a seriously good plate reverb and a very strong first product for Rare Signals. I can't wait to see what they come up with next.